(CNS): Election officials are expected to confirm Thursday the position that the office will take, now that the campaign for the May General Election has officially started, on the provision of food, drink and entertainment at campaign rallies. With the anti-corruption law now in place, “treating” is illegal and the traditional lavish catering at political events may fall foul of that law. Direct favours, such as cash or gifts of any kind — from kitchen appliances to marl — given by candidates, agents or other supports to induce voters to cast their ballot in a certain way are easily defined as corruption, refreshments at political meetings are still in question. Speaking about the issue on Wednesday evening, Governor Duncan Taylor said it would be down to the Elections Office and the chair of the Anti-Corruption Commission about the warnings they would give to candidates about how far the refreshment provision could go. He said that any favour or treat given in order to persuade an elector to vote in a particular way was illegal. “There has to be an element of a judgment call and the issue here is whether you are offering something … in exchange for somebody agreeing to vote in a particular way. That is what’s illegal,” he said. “To call people to a campaign rally where you give speeches and promote your party or yourself as an independent and you are offering a drink and a donut during the rally, I don’ t think that would necessarily constitute treating,” he said, but warned that it is the concept of inducement behind the treating that is the problem. Given the scale of the “treating” that has gone on in the past at rallies, Elections Supervisor Kearney Gomez has said the issue is being given serious consideration because the Elections Office does have concerns. He said that in the recent Turks and Caicos Islands election the extensive catering at political meetings was stopped. Gomez confirmed that the office was hoping to issue clear guidelines today but warned candidates that treating was illegal. Last night, there were several political meetings and Stefan Baraud, an indpendent for George Town, confirmed that after hearing that catering was being considered as treating he sent back the food his team had organised. However, food was still served at the major rally held by the C4C candidates Wednesday evening in the car park at AL Thompson. If you want a large crowd, you have to provide free food, or else no one will turn up. Thats in Cayman, anyway… because we're an unpassionate group of indivuduals. This is a time in our history to make a positive change in our government and our islands, to elect someone who will represent us intelligently and whole-heartedly and still we have no interest in coming to hear the possible candidates for the future of our country speak. Not unless they're giving us something for being there. Just pathetic. Ifyou, as a citizen of the country, are interested or concerned in the way the islands are moving forward (not backward, as the case may be), then is it not your civil duty to go and find out as much as you can about the candidates you may be putting in power? One cannot simply stand back and complain about the fate of our island home if you're not willing to put in some effort too. Getting our islands back on track will be a two way road – and we have to stand up and be an intelligent, cohesive and well-informed population to make the right decisions. Progress will never happen if people aren't willing to come to political events such as these unless they're giving out some conch stew and heavy cake for you to take home. So what???!!! What is sooooo wrong with providing food and drinks at political functions. At the end of the day, only fools would vote in the wrong candidates – food or no food, drink or no drinks! I make a bet – I bet you West Bayers will vote in UDP members this next election and it is not going to be food or drink that will persuade them to vote thus. If offering food at a political meeting could be construed as an influence to vote buying- what is the difference with a candidate getting up on the platform and asking the electorate to support them? Do advertising on a blog or a newspaper a type of influence? The food is not asking anyone for anything! All its say is “Please eat me- and enjoy it” I think this is an insult to the electorate- and supporters. It’s a shame to see what is happening in Cayman Politics- I for one had all intentions to vote- but after this announcement- I will not be placing my vote anywhere- I am so sorry if my vote could have made a difference in the a candidate to be elected- but until the system stop insulting me and other honest and intelligent persons, I have no such part of this election. I hope that one of these candidates quickly obtains clarification from the office of the DPP because it’s needed. I can’t imagine that someone would be willing to sell their vote for a plate of food. This might be the case for some of the more expensive items that I have heard about but not a plate of food. actually you'd be surprised how ignorant people could be. I heard a lady telling a cook that he must give her a plate of food because her husband votes and he won't give her husband a vote if she doesn't get her food. I joked with her and said, "your vote is cheap. If that's all you want in life is a plate of food." 2. it was many years ago. People sell their votes so they can keep on eating turtle meat. Many things happen here that one cannot imagine. That only shows the limits of imagination. Caymanians can and do sell their votes for food. Food is present at as many places and events as it possibly can be. It is equivalent to the way bribes or 'advance payments' operate in the Middle East. All invitations and functions are assessed on the quantity and quality of food offered. Any event that does not have food is a lost opportunity to eat food. Aside from that cultural concept, there is real poverty here, and if a political rally offers the chance to feed your children for free, you will take it. The stage then is set for you to vote for a certain group out of gratitude. Moreover, a full stomach is a satisfying feeling that diverts energy and attention from listening and processing. These concepts feed the ignoranceof the average voter, pun most definitely intended. But only if you can't see. I do not think having food at a Political function is wrong. Distributing T-Shirts with slogans of party and individuals should be considered more wrong than the food and water served. The food can cater to the poor, the old, the special needs, the medical challenged and the hungry, T – Shirths cannot quench the hungered, the sick or the thirsty person. The Election Office has it all wrong. They have mis interpreted the anti corruption so wrong. There are more important things they need to pay attention to, such as what is being said on the stages in regards to the personal attacks and the name callings. The personal telephone calls and the threats that are taking place by some candidates and their supporters are used to do some of these intimidations. Does this mean that the turtle meat will not be coming to my door in Bodden Town this year? Free food & drink don’t change the way we think about these candidates! plus it’s our culture to have food & drink at functions! It may be s culture shock to outsiders but that is the norm in the Cayman Islands & Caribbean! It’s their manifestos that matters! Mckeeva, Alden, Rolston??? I hope you all see your chance now to eliminate some competition. The law is the law, right? Well these people are supposed to be smarter than to break it so blatantly. Report it. And show them why politics is a dirty game best played by the old boys. Simple. Just have it in Capt Bakery parking lot. Problem solved. The law speaks of food, drink & entertainment. I understand there was a big party in the WB Govt. housing area (off Birch Tree Hill) on Thursday (28/03) evening which was provided by the UDP. I am quite sure that the house holders did not fund it themselves. Not sure if the UDP candidates arrived before everyone was well into the food, drink & entertainment or how long they stayed. But one can presume that the party goers all knew who their benefactors were. This shows the true measure of those candidates. Maybe the Election Office should advise the public who the enforcers of the law is and give a number to call to report inproper actions like this. To whomever wrote this unjustly email, I am the homeowner in question about the party on Thursday night. THIS WAS A BIRTHDAY PARTY FOR MYSELF AND MY FATHER AND WAS IN NO WAY FUNDED BY THE UDP OF ANY POLITCAL PARTY.This was paid for BY my myself and father therefore you people need to shut up and mind your own business and talk what you know. This is what most of you do begrudge other people for what they have. Like it or not WE can aafford a bash like what we had. How does C4C plan to deal with the report to the ellection office re the spending? Will it all be but on the independents? people dont be fooled by this c4c party! They think because they are a bunch of accountants and lawyers that they can do what they want! I have news for you! watch how quickly you will be forgotten if they get in. Seriously folks!??! To those of you complaining that you're going straight from work – bring something from home and take it with you!! I agree that no "freebies" should be given in order that every effort is made to ensure this upcoming election is free of corruption. Bringing my own to a meeting is a very small price to pay. Whilst I think the food and booze is an issue, it is not as big an issue as the other "gifts". 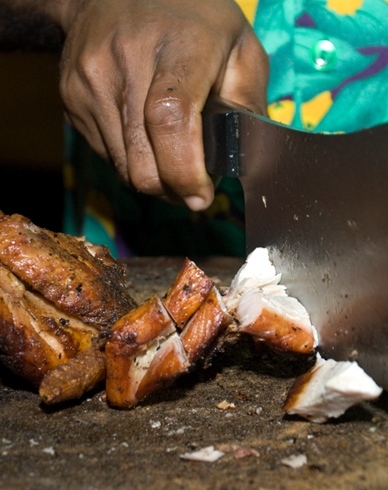 Food is a big part of any West Indian gathering but if it is now an offence, so be it. There should be a total crackdown on all of the other stuff too though. From today until after election day. We all know it happens, we all see the newly paved roads in West Bay and the rumours of more paving, donations to churches, roof repairs, cash etc….. It's so bad up there that people will ask if you or the candidate will be giving out money. They will tell you that they won't vote for you or the candidate if you don't. The answer to that is "so don't vote for me". Would Ezzard please let us know how he feels about all the illegal camping currently taking place and what he proposes be done about it? Hmmmm, with so many candidates in the race, perhaps us voters should band together and hold a vote auction. We could all clean up by selling to the highest bidder. It is a good plan because we get up-front money from the politicians themselves to help offset the higher taxes that will enact in the future to fund their empire building (oops, nation building is the correct term I believe) within the government. Maybe we could each pitch in a nickel each and give the political bidders a free bottle of pop. A charitable donation for Pines in exchange for food? The Pines, yea right! Somebody needs to keep a closer eye on that place’s finances! C4C should be disqualified. They commited an offense under the elections law! Our election Observers are here! Lets see what they and the elections office intend to do with a blatant breach of the law! breaking the law is breaking the law, no if's and's about it! cool! every party and indpendent who had a meeting prior to this announcement was also be disqualified. lets go jo! talk about a clean slate:)! Yeah, that one is so big that we are going to demand that it be paid back to Government. This strikes at the heart of Caymans democracy! How will anyone know who is worth voting for if they don’t get say a fridge, or paving, or some other goody? They can’t be expected to listen to speeches, or judge honesty in a candidate, or consider what their policies are without some material help! This is surely the end of democracy as we know it. I go to a meeting to hear a politicians views – and you are telling me that if they serve me a cool drink and meal that they are buying my vote???? It has been a long standing tradition that whenever there is some sort of public gathering or meeting that refreshments of some type are served afterwards. If you are going to go after political candidates then you need to crack down on all government entities and elected politicians to refrain from any sort of refreshments at their meetings. Get Real – providing food is corrupt??? We got enough trouble with crime, unemployment, government overspending, drugs, etc. We are so corrupt we do not even recognize it anymore. They are 9000 people bought and paid for and you know how they are going to vote. Once the masses realize they can vote themselves money from the treasury the end if not far off. Hello Bannana republic. Awww, heck! With 58 hopefuls running, I was lookin' forward to some great meals! Now my hopes of saving considerably on my food bills by attending the meetings are in peril. Darn! Now I will have to stick with all the free "treats" at Happy Hour throughout the island. On a serious note, if the officials are concerned about the concept of "inducement" being behind the food fetes at rallys, then anything beyond what which would be necessary to provide a little blood sugar boost, say, light snacks and a cup of punch, should be considered "treating". Full meals would certainly act as an inducement. Let's look at another way: suppose all candidates were flat dead equal, say clones of each other. Nothing different except some offer no refreshments at their rallies. All things being equal, my vote would certainly go to the one who offered the best dining experience at their rally. Looking at it this way and you clearly see that giving away just about any freebie as an inducement to vota a certain way is "treating". I disagree with the Governor where he says that "the issue here is whether you are offering something … in exchange for somebody agreeing to vote in a particular way". I hope the election officials ignore his less than savvy comment. The Governor's graps of the Election Law (2009 Revision) law appears to be appallingly lacking! He should have just kept his yap shut. The law says nothing about someone "agreeing" to vote a certain way! The section on "treating" pivots on this: "…giving or providing any food, drink, entertainment or provision to or for any persons for the purpose of corruptly influencing that person, or any other person…(to vote in a certain way)…" The person subject to treating does not have to "agree" to anything. The law focuses on "influence" and intent. If the objective of the one(s) providing the treat is to merely influence a voter to vote in certain way then the law is contravened. In my opinion if the intent of the person offering the treat is to increase the attendance at meetings at which persons attending will be influenced to vote for the subject candidate, or if the treat could in any way create a feelng of reciprocity, then the treat is a corrupt influence and the law is breeched. If the candidates and parties really wanted to do someting positive and healthy (yeah I know this is a BIG expectation for this den of pirates, but one can hope, eh? )…the refreshments at the meetings could consist of fruit juices, fresh fruit, veggie, and grain snacks, and pleanty of good old watah. The Minister of Health and Makeeva should be the first ones to set such an example. Let's see if their commitment to health is just a show or the real deal. C4C'ers are staring to show their true colors! Integrity my A$$!!! The law clearly stated that serving food was illegal! Shame on you C4C. Your not fooling us! Hi, I attended the C4C meeting last night. Both my wife and I worked nonstop all day. Left work at 6:30 famished. Stayed for the entire program. Still famished. The candidates suggested that they would mingle with thecrowd and that there was food. Great, I had a few questions. Grabbed a quick bite and buttoned holed Jude Scott, couldn’t hear him over the load music. Terrible. Within 20 minutes most of the crowd had move as far away from the music as possible and I had a few conversations. Good. Meetings scheduled just after work should have something to tide the hungry over or they will skip the meeting and go home to cook. I actually asked Jennifer if we should just go home, but I really want to hear what C4C had to say, so I decided for both of us. I doubt that food at a political rally would buy a vote. It might encourage some hungry soles to come out, populate the chairs and hear the msg. Less people are eating in Cayman now than at any other time in our history. As long as every politician does it than there is no favoritism and no unfair advantage. Well.. a really great steak might just do the trick. Unfortunately the C4C food was just fair, although hunger made it tastier. Looking around …. I don't see too many famished voters in the Cayman Islands! I think this is good. These rallies are not social gatherings but opportunities for citizens to learn about what the potential leaders of Cayman can offer the country. Food and entertainment is nice but not in such cases. Things need to be kept in focus. This is ridiculous. I am amazed at the little things that consume us now. If my vote can be bought for a plate of food or which campaign has the best food, something is completely wrong with me. What do they take us for, idiots? They are many poor starving people that go from meeting to meeting just to have something to eat each night. Hopefully, while doing so they listen a little to the candidates so they can chose one. I am sick of the C4C hypocrisy. This group is lying to people about who it is. Those affiliated with this "political awareness and advocacy group" need to stop pretending they are not a party to get around the rules by which everyone has to play. It is sickening how they are acting like they can save the world, yet flaunt their money and their power to do as they wish. The fact of the matter is any candidate who is linked to this group in any way – and that includes theso called "endorsement" some people have sought – will be held liable under the Anti-Corruption Law for any form of treating. So C4C go ahead. Flex your muscles. Keep saying, "We're not a party, so we can spend how ever much money we want and do as we wish." But remember, we're watching. And I can guarantee you no amount of flexing and feeding will deter the Old Guard at the Elections Office from doing their job. And I'm certain you're not helping your "endorsed candidates," no matter how much cash you dole out. We're on to you. You can't fool all the people all of the time. Yeah, all that lavish curry goat and ox tail corruption. Why sre some of us so petty and stupid. Do you all think that alittle refreshment after a meeting can buy a vote? Voters has gotten spoiled with big stuff brethern such as tickets including cruises appliances etc etc. Then Politicians are not seen afterwards for another 4 years. Alot of people leave from work to attend meetings so alittle refreshment are the least that can be offered to them. Most of the time the food is given by their supporters. Was it that big meeting that Capt Mose had up Spot Bay that has some people scared? Or could it be that good food that Lyndons mother can cook up? Some of the best food ever. Capt Mose you gone clear, the race is between the others. no i would not give a vote for that price but i have heard votes go for loads of top soils or fridges or stoves. But no not for curry goat. Just those boring donley face people looking for politicians with sticky fingers..
Good. We're not here to lavish on free food and party. At rallies people need to pay attention and make sure they use whatever common sense they have to put a GOOD leader in power when it comes to voting time (i.e. not bush, rollie, foolio, capt eugene (who collects MLA salary for nothing), JuJu…and the list goes on). Damn it….us folks that are strapped for cash will miss these meetings just for the free food. "I work too damn hard to be this f@#%ing poor! Gomez should think of something more important to worry about. Having food so people will come and listen to your sales pitch is not much of a problem. It is clearly different than buying votes. Are we really concerned that someone will sell their vote for a drumstick? Unfortunately, some people do sell their vote for a beer and a ride to the polling station at the end of the day in West Bay. Sad but true. Correct 09.14…but just in case the back door of our house is unlocked, we like champagne (Veuve Cliquot please), caviar and lobster and cash goes down well too. No fridges please, last one is still good. Cost should be value for money otherwise it’s still a bribe. Elections Office needs to clarify. The idea of me voting for someone because they gave me a small plate of food at a political meeting is very insulting. Just goes to show how little respect and how little the elections office think of Caymanians. As if everybody is for sale. I support having refreshments at every meeting after all, some of these meeting last until 10 at night, and by the time you get home it would be a bit too late to have to prepare something to eat. All of the excitenment and hype tend to make people hungry – don't see anything wrong with ight refreshments being served. There is a law in the books that says it is illegal. What do you not understand about that? This is stupid and ridicilous if alittle water cant be given at a meeting. If you all want to know it most of the people bragg that they go to the meetings and eat them out and vote them out any how. How do you deal with the cooks and other friends that get the big gifts . A few days ago one of their cooks and supporters was running them down in Cayman Brac and since the last week they are now singing praises to them, what do you think has happened? I do not think there should be any charge for refreshments, because then there must be a Trade & business licence to do this. However for whom ever to suggest that water, drinks and a few sandwiches cannot be given out at political rallies are just down right mean. Some people do not get the chance to go home from work and stop to the meetings. You really mean to say that they cannot be offered a bottle of water, a drink or a snack. CAYMAN GET REAL. There is nothing wrong with this. It has been goin on for as many years as I can think of. It has been happening from the day of democracy at Pedro St James Castle. The slaves danced and played music, and served up fried pork with boiled cassava. Who broght this up anyway? There are time like this that I wish I was not a Caymanian, because the only words to come to my mind is MY PEOPLE. How about you do something in life that doesn't revolve around your over sized stomach's. Exactly. I watched the two biggest women at a birthday party leave with the two biggest plates of food. Those suckers were piled almost as high as the bluff and full of cakes. Yes, sell the chicken at cost. After all, they can say they’re not profiting from the food and drink. 30 cents for pop/water and 2 dollars for jerk chicken, rice and beans. Oh, one more thing I forgot to mention. The parties don’t have trade and business licenses to profit from food and drink so they would have to sell it a cost or below cost. Spoken like a true Party person. He who buys your vote will sell you. Actually, that would not be OK, it is the receipt of anything, not anything free which is the issue. I have to say though, the cash rolled up in T-shirts, electricity and water bills paid in cash, the $100 bill in a white envelope after they vote, the loads of marl, the roads paved, the recent cheque rumoured to be given to the same WB church, all need to be totally wiped out, not just tightened up on. ALL of it is, and always was, grossly illegal. Now it is just easier to convict and the recipient is also deemed to be just as guilty. You not gonna hear anybody talk about that!! People act like this bunch just because they are lawyers, accounts etc they can run a country!! What a joke, wouldn't vote for them if they were my only choice!! For the ppl yeah right!! They aint gonna speak to anybody unless you call big business!! Don't be fooled ppl, they were all UDP at some point in time!! You think you got corruption now, vote them in and you will see!!! !